Russia is expected to enter a recession next year for the first time since the global financial crisis in 2009 as the ruble and oil prices continue to fall. How will the Russian economy fare after ruble collapse? forecast. The ministry had previously predicted growth of about 1.2 percent next year. “Most macroeconomic indicators for the economy will worsen through the next three quarters and will look a whole lot worse by the time we get to next summer,” wrote Chris Weafer, a senior partner at the Moscow-based Macro Advisory and a long-time observer of Russia’s economy, in a note posted on the firm’s Web site. Russia’s Finance Ministry said it tentatively supported the forecast for a 0.8 percent decline in 2015 — but only on the assumption that oil prices average about $80 a barrel. The contraction may accelerate to 3.5 percent or 4 percent if the price of oil averages $60 a barrel or less, the Finance Ministry estimates, according to a statement posted on the ministry’s website by the director of the long-term strategic planning department, Maxim Oreshkin, on Dec. 2. Crude oil sank below $60 per barrel in December for the first time since 2010 as the Organization of Petroleum Exporting Countries decided not to reduce output, and shale-oil production in the U.S. continued to rise. Oil prices continued to fall throughout the month. Russia, currently the world’s biggest energy exporter, is pumping crude at near-record levels of more than 10 million barrels a day. 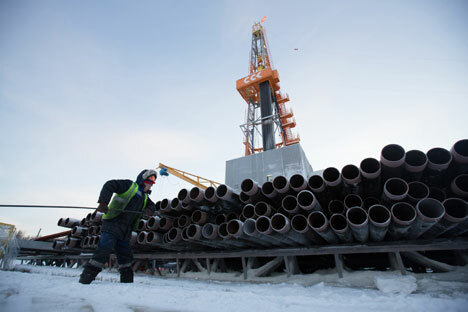 Oil and natural gas accounted for 68 percent of Russia’s total exports in 2013, according to the U.S. Energy Information Agency. Inflation may reach 9.8 percent year-on-year in 2014 and peak at “double-digit growth” in the first quarter of 2015, Moscow-based brokerage UralSib predicted. Inflation will spike following the sharp decline of the ruble “because normally prices grow for 3–4 months after an exchange rate shock,” UralSib analysts Alexei Devyatov and Olga Sterina wrote in a note to investors on Dec. 5.
prices, giving Russian energy firms and the government extra rubles for every dollar’s worth of foreign oil sales. In a feisty state-of-the-nation speech on Dec. 4, Putin acknowledged the challenges facing the economy, and offered a raft of measures in response. He pledged to reduce intrusive government inspections on small businesses, establish two-year tax holidays for new small businesses and initiate a full amnesty for Russians who return capital to the country from abroad. Putin charged officials to work to deter currency speculators from driving down the ruble. However, Putin also noted that a weaker ruble would also help make Russian goods more competitive, and called on Russian producers to use the opportunity to seize market share from foreign competitors over the next few years.